The most important reason for establishing a program of regular roof maintenance is to protect the owner’s investment. A proper maintenance program will not only add years to the life of a roof by detecting minor problems before they become major, it will also provide better protection for the internal functions of a building. 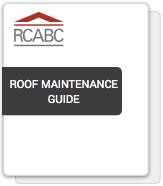 This guide covers topics such as basic preventative maintenance, identifying roofing defects and the RGC Guarantee.